Saturdays 11am The Parade Community Centre Hoylake . Wednesday's - 7.45pm. Wallasey Group. Address given upon booking. This is a small established friendly group of women of improver to advanced level belly dance students who share an interest in learning higher level technique, Props, Performance (optional) and full choreographed belly dance routines. Performance is optional however there are plenty of opportunities throughout the year. New members are always welcome but are expected to have some experience learning how to belly dance with Tara or elsewhere. Drop in £6.50 new students. £25 membership price @£5 per class in blocks of 5 sessions. This class runs for 60-75 mins. Sorry there are no refunds on missed classes. Running on a weekly basis. Join at any point but contact with your information. Venue address is given upon booking. You can pay at class with cash or use PayPal if you prefer. 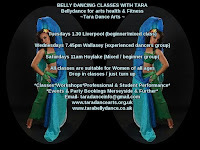 About Tara's dance arts classes - These classes are suitable for women of all ages body shapes and dance / fitness levels. Whether you want to attend for exercise, Social or a performance art there is something for everyone. We are often invited to social belly dance parties (haflas) and shows where we can watch or perform or do both! We have our own private outings and performance (optional). Each class lasts for one hour. The classes focus on belly dance as an art form, Belly dance for health and belly dance for fitness. When belly dance is taken up as an artistic hobby or professional performance art we focus on authentic dance technique improvisation and choreographic concepts from Egypt Turkey and North Africa in the styles of classic theatrical and folkloric. Belly dancing has many health benefits that have been proven to help Women. A recent Chinese study found that belly dancing highly improved women's bladder health and strength to the point where some women avoided surgery. Belly dancing is female friendly and encourages women of all ages and body types to get involved it doesn't matter if you consider yourself curvy or slim all women are welcome. It may improve confidence self expression creativity and self esteem. Although belly dancing is low impact it can be a safe uplifting cardio flexibility and resistance workout at moderate intensity depending on how it is taught and how the class is planned. The shimmies steps and other heart pumping moves are easy styles of dance cardio but if you where to try some of the easy folkloric styles with lots of steps and upbeat moves you'll soon work up a sweat in no time. Some people think that belly dance as fitness is Jane Fonda in a leotard on steroids but if we observe authentic belly dance from the countries it comes from we witness many styles that can be very upbeat and great for cardio if implemented into a belly dance class appropriately. What To Wear - Every belly dance class is different but at ours it is important to wear appropriate clothing for your health and safety. Dance yoga or gym clothing with breathable material is great or leggings and a top. It is essential that clothing is not to long or to tight. Most belly dancers and belly dance students dance bare foot however you may prefer to wear dance shoes. Flat ballet style belly dance or jazz shoes that are soft and flexible. Coin hip belts and other props are provided at class for all to wear/use and return. Tara is a working professional belly dancer with 12 years of experience as a professional entertainer soloist and folkloric troupe performer. Her classes have been running in various venues of Liverpool and Wirral since 2013. They have been featured in printed publications television and radio. Tara is employed to teach at the local charity WHISC in Liverpool and is the artistic director of her student performance troupe Nefertiti. She has relevant and up to date qualifications / certificates in Dance, Fitness, Makeup Artistry and teaching. She sees herself as a facilitator of community dance. 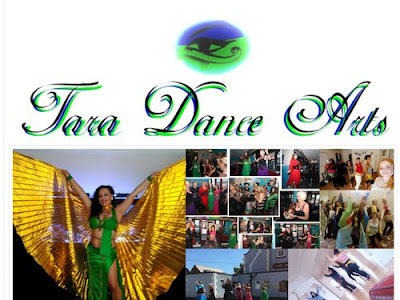 She is fully insured and a professional member of Foundation For Community Dance People Dancing (ffcd) and is Wirral Trading standards assured. Nefertiti started out as a group of women students who attended Taras class. The group is made up of women of different ages experience and disabilities. We have created high standard theatrical belly dance shows and belly dance for everyone performance and workshops.